Here are some of my favorite Christmas pictures that I would like to share with you. Some of these images on this page are courtesy of The TiggerGirl and Welcome to Heffalump Corner (Thanks to everyone of them). Enjoy these adorable pictures. 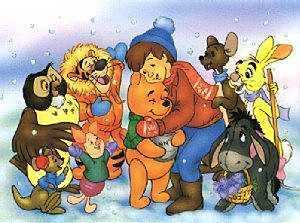 Pooh gets a nice warm hug from all his friends. 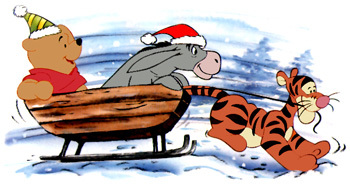 Santa Pooh and his helping elf, Piglet. It's not much of a tree, but I am kinda' attached to it. "It's nice to get a gift without expecting to get one." 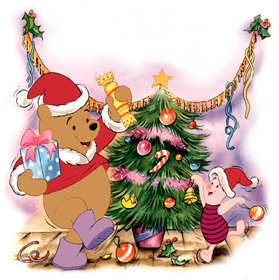 Pooh, Piglet, and Eeyore decorate a cute little tree! Have you seen an Eeyore fly? Too cute, huh? Hark the Herald! Piglet and Eeyore sing. Blessed Holiday and a Very Happy And Safe New Year! 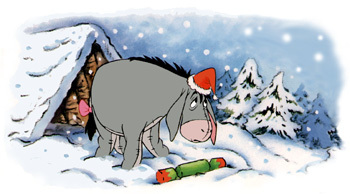 This page was created by Eeyore Girl and last maintained on November 16, 2002.